It's been a minute since I've released a blog post, and for that I apologize. Rest assured we are still hard at work getting ready to release our newest book, "Fred and Ginger Every Thursday" (which should be released on Kindle THIS WEEK), a delightful romantic comedy with elements of farce that is based on the very first screenplay my mother and I wrote together (see my first blog post for *that* story...). We met with our cover designer Friday (hi, Davey!) who has outdone himself in a gorgeous homage to the stylized art deco that makes people stop short when they see it displayed in galleries and art shops. Speaking of art, my mother, who is a decidedly accomplished artist in multiple genres, has been preparing for the latest art show she is a part of, by creating some absolutely stunning new figures. She's a multiple medium artist, and I've managed to snap a quick pic of one of the items (not yet titled) that will be included in the show. 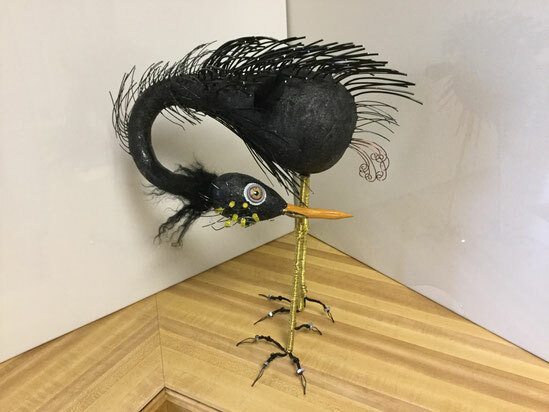 This sassy beauty has a body made of gourds, and includes yak hair, gears, and all kinds of wire, including covered wire that mimics its molting feathers on the top. She's also planning to have a dragon mask, which I haven't seen yet but as soon as I do I will post pics of that as well. Until then, have a great week and I will talk to you all soon!